So the weather here in Maine has been good and bad this spring. My allergies have been horrible and to top it off I picked up some sort of virus that has had me feeling pretty lousy these past few weeks. It has been a chilly, damp rainy spring here along the coast of Maine. If you notice the date on the thermometer it is May 28th. 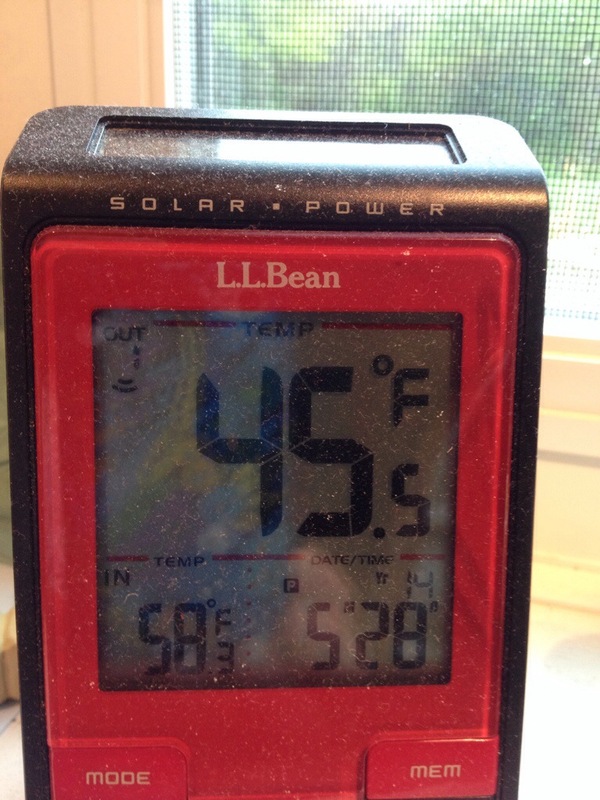 45 degrees on May 28th, that is crazy! 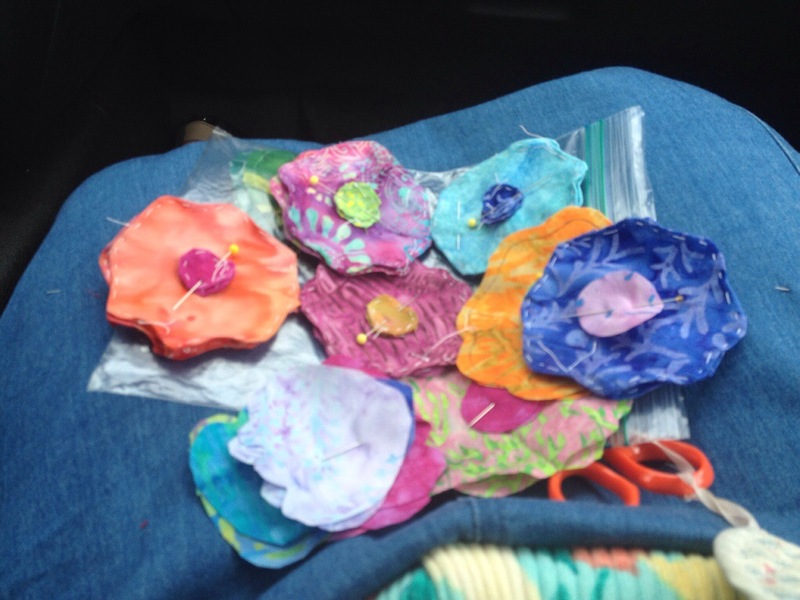 This is a picture of some of the flower parts that have since been appliquéd onto the raffle quilt. I have done my part, now another member is doing the long arm quilting, she will then pass it to yet another member who will put the binding on. It is wonderful when we have a group of quilters working together. 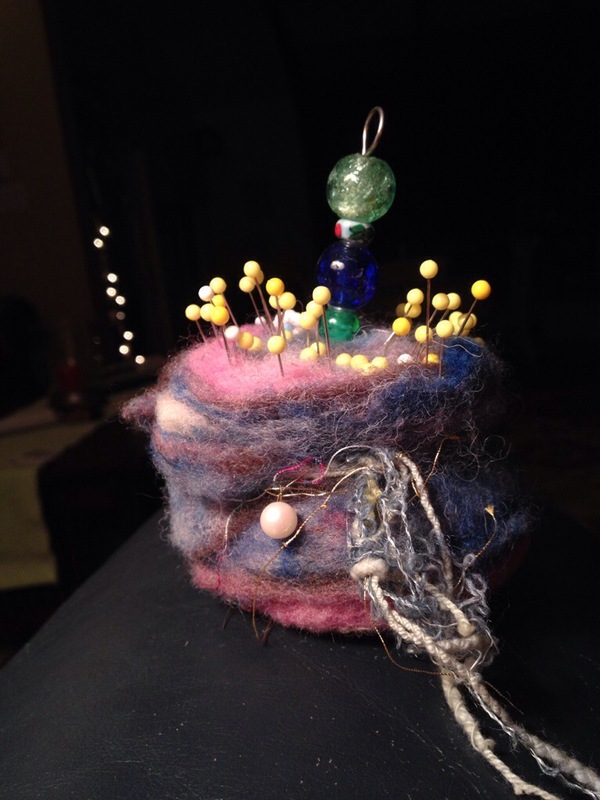 This is a picture of my favorite pincushion. I have had it for over 20 years, it is wool roving that has been rolled together. I love the colors and the size and shape. Last weekend I used my new FreshTech canner. I made strawberry rhubarb jam and strawberry jam. 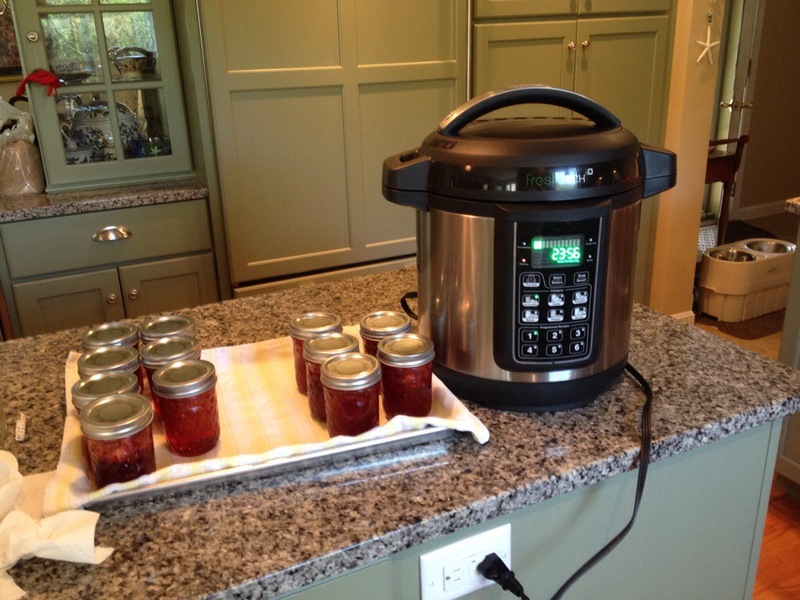 It was very easy to make with my new canner and it didn’t heat up my kitchen and it was done very quickly. 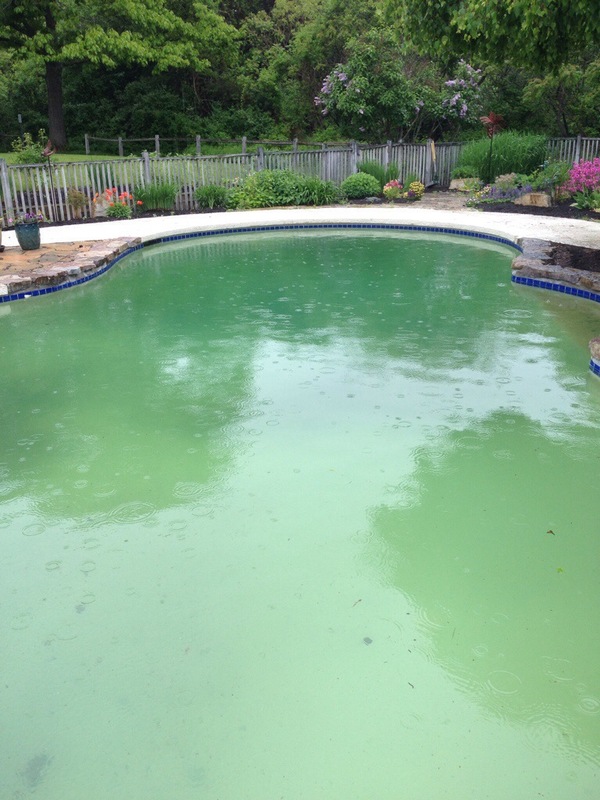 Our pool was opened today – they worked amidst the rain drops. It needs to clear up before we can vacuum it but the fact that it is open means summer must be on it’s way. It looks more like pond than a pool but once the water clears it will be crystal clear and Gracie (our chocolate lab) will be swimming long before any people do. 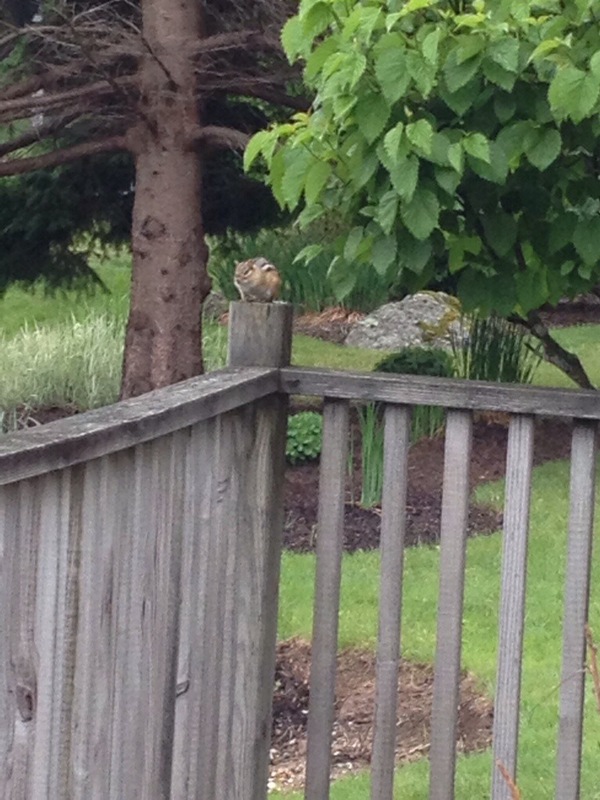 This little fellow was watching the pool opening. The pool cover had been protecting one of his little holes and now that the cover is off the entrance to his home is no longer hidden. I don’t think he was very happy. Oh well he can move out anytime – that would be fine with me. So now I will get back to some of my other projects – I have a long list of quilts to make. ← Why do we make quilts….